6.1M/20 foot Overall height mast with pivoting base for ease of windsock servicing including Mild steel swivel head and arm with sealed bearing races. Finished in exterior quality paint to customer choice. 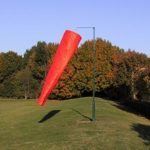 Suitable for flying windsocks up to and including International Airport Size( 4.27M/14foot). CALL US ON 01780 740644 we welcome Credit Card Payment. Alternatively email order and we will respond to process your purchase.